Reports show the Trump White House is planning to go on offense and the Trump campaign is working on their 2020 plan now that Atty. General Barr's summary on the Mueller report is out. Now that the Mueller investigation has concluded, Democrats on the Hill are calling for the full report to be released and have questions for Attorney General William Barr. Fmr. Congressman David Jolly joins to discuss. Now that Donald Trump’s handpicked Attorney General William Barr has issued a laughable mischaracterization of the Mueller report, and Team Trump is falsely claiming it’s been exonerated accordingly, House Democrats have an urgent need to do everything in their power to get their hands on the Mueller report immediately. In the meantime, Barr and Trump’s allies are already publicly discussing releasing the report – but something stinks here. Republican Senator Lindsey Graham, who in recent months has become an almost cartoonishly loyal Trump ally, and who was seen partying with Donald Trump at Mar-a-Lago this past weekend, is now telling NBC News that he spoke with William Barr today, and that Barr “will be working with Special Counsel Mueller to release a declassified version of the final report “sooner rather than later.” We assume that this is referring to the entire Mueller report, with the exception of any classified information. But this raises a number of questions. First, why is Barr plotting this out with Lindsey Graham of all people? Graham is the Chairman of the Senate Judiciary Committee, but he has no more standing here than any the other Chairs of the other House and Senate committees with investigative power. Is Barr also having these conversations with House Judiciary Committee Chairman Jerry Nadler and House Intelligence Committee Adam Schiff, or is Barr only plotting out the release of the Mueller report with Trump’s allies? If it’s the latter, then something is very wrong. House Democrats will no doubt quickly move to use their subpoena power to obtain the Mueller report, or to bring Mueller himself in to publicly testify about what’s really in his report, or both. Now it appears they’ll also have to contend with whatever William Barr and Lindsey Graham are cooking up here. Barr’s “summary” of the Mueller report is so absurd on its face, he and the GOP can’t be trusted to release an accurate version of the report, either. For all we know, they could black out every other half-sentence, in the hope of changing its context entirely. The post The real Robert Mueller report is supposedly coming “sooner rather than later” – but something doesn’t add up here appeared first on Palmer Report. Senate Democrat: William Barr's summary of the Mueller report is "brazenly devious"
If Donald Trump’s puppet Attorney General William Barr had released an even halfway believable “summary” of Robert Mueller’s report, more people might be falling for it. But because Barr had to release such an obviously and cartoonishly inaccurate summary, it’s taken all of minutes for the public, the media, and the politicians to begin poking mile-wide holes in Barr’s attempted coverup. Senator Richard Blumenthal, who sits on the Senate Judiciary Committee, appeared on MSNBC on Sunday evening and minced no words: “This letter is elegantly but brazenly devious. What [Bill] Barr has done is essentially to frame the message before the facts are available, before the substance is accessible. He has in effect created headlines that will create a trap for all of us.” Blumenthal was just getting started. The Senator went on to offer a plausible explanation for why Barr’s summary might be claiming that Mueller found no collusion: “The crime of obstruction is designed to prevent destruction of evidence, whether it’s witness tampering or document destruction. So the finding here that there was insufficient evidence to establish collusion may be the result of that obstruction.” There’s also a different theory about Barr having limited his collusion claims to the Russian government itself, as opposed to Russian government representatives. Senator Blumenthal also seemed to hint that the Democrats could subpoena Trump to testify: “One question I have, which really hasn’t been explored, is why the Special Counsel did not force an interview with Donald Trump. You mentioned earlier that there have been thousands of subpoenas. Why not a subpoena for Donald Trump? I have great respect for Bob Mueller, but I said from the very start that Trump has to be interviewed under oath, just as other presidents have been before.” The Senate Judiciary Committee won’t do that, but the House Judiciary Committee certainly can. Mueller won’t save us from Trump’s corruption. What will? Trump says 'it wouldn't bother me at all' if full Mueller report is released – live The Guardian: The president says it is up to the attorney general whether the full details of the Trump-Russia investigation are released. The president says it is up to the attorney general whether the full details of the Trump-Russia investigation are released. As President Trump welcomed Israeli Prime Minister Benjamin Netanyahu to the White House Monday, the Israel Defense Forces announced they have begun striking Hamas targets along the Gaza Strip after a rocket fired from the Gaza Strip hit a residence in Israel. "Our prayers are with our friends in Israel as they carry out an incredible way of life in the face of great terror," Mr. Trump said, adding the U.S. represents Israel's "right to defend itself." Netanyahu was supposed to have a state dinner at the White House Tuesday and address the American Israel Public Affairs Committee (AIPAC), but cut his visit short after the residential rocket hit, building on already sky-high tensions in the region. Israeli Prime Minister Benjamin Netanyahu mocked the investigations that have plagued Donald Trump’s administration at the White House on Monday, as the president signed an executive order officially announcing U.S. recognition of Israeli sovereignty over the disputed Golan Heights. The Israeli leader’s remark came a day after Attorney General William Barr officially revealed the conclusions of special counsel Robert Mueller’s 22-month-long investigation into whether or not Trump’s 2016 campaign team colluded with Russia. Mueller’s final report concluded Trump and his associates did not conspire with Moscow, although it left open the possibility that the president had obstructed justice by interfering with the probe. Netanyahu’s joke was met with laughter, and Trump, smiling broadly, shook the Israeli leader’s hand. The president’s staff, including his son-in-law and senior adviser, Jared Kushner, smiled in the background. Notably, the Israeli prime minister is facing indictment back home for alleged corruption. Netanyahu has been accused of favorably adjusting regulations to benefit Bezeq telecommunications, which in turn provided favorable media coverage. The prime minister and his wife allegedly accepted bribes as part of the scandal, including cigars, champagne and jewelry. 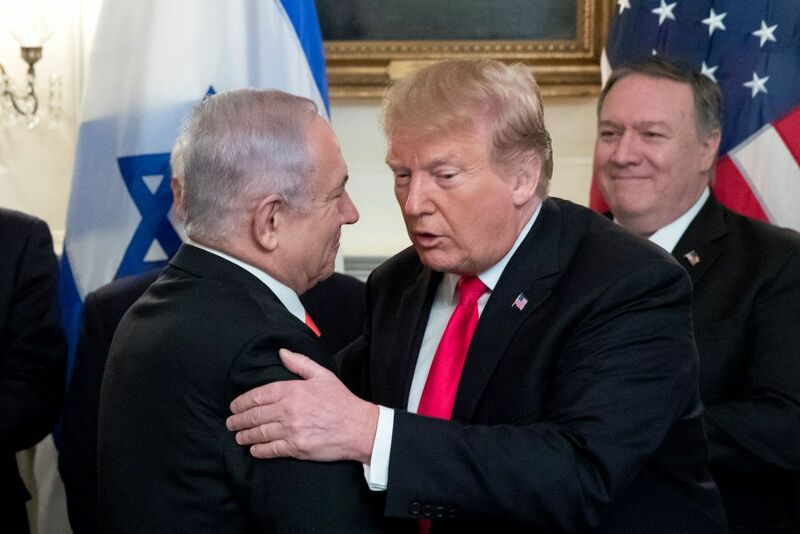 As Netanyahu faces a neck-and-neck election early next month, Trump’s decision to recognize Israel’s claim to the Golan Heights, which were captured from Syria in 1967 and later annexed, is widely seen as an attempt to boost a close political ally in the Middle East. The international community, based on numerous resolutions from the United Nations, does not recognize Israel’s claim to the territory. “Under my administration, the unbreakable alliance between the United States and Israel has never been stronger," Trump told reporters at the White House on Monday, Bloomberg reported. Since taking office, the president has gone counter to decades of U.S. foreign policy toward Israel, officially recognizing Jerusalem as the country’s capital and disregarding the Palestinians claim to the historic city. He has also cut U.S. funding to the Palestinians and taken a hardline stance against Israel’s arch regional rival, Iran. 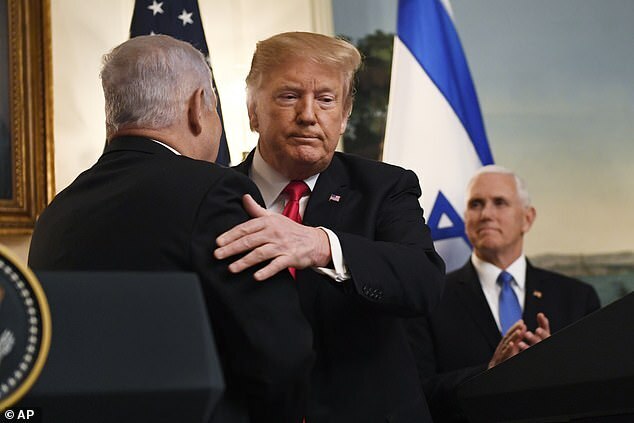 Analysts have suggested that if Netanyahu fails to win the upcoming April election, Trump’s foreign policy toward the region could face a significant roadblock. The president has tasked his son-in-law Kushner with mapping out a Middle East peace deal, but Netanyahu’s possible loss in the election may potentially derail the plan altogether. Special counsel Robert Mueller’s team included forensic accountants who helped the former FBI director investigate allegations of collusion between the Trump campaign and Russia, according to a letter released Sunday by Attorney General William Barr summarizing Mueller’s findings. The brief summary did not discuss the exact work of the forensic accountants, but Mueller’s team was involved in investigating former Trump campaign chairman Paul Manafort, who was convicted of tax fraud and bank fraud charges, and former Trump attorney Michael Cohen, who was convicted of tax fraud and lying to Congress. Mueller’s team also reportedly subpoenaed records from Deutsche Bank concerning Trump-related entities. With tax season just around the corner, this web seminar will cover the latest regulatory and legislative developments, including last-minute year-end activity in Congress. The president says he’s completely exonerated, but his potential legal perils are far from over. Chris Jansing is joined by NBC News Investigative Reporter Tom Winter and Former US Attorney Preet Bharara to discuss additional investigations from Federal and State officials. Democrats are weighing the options about what to do next following the Mueller report. Chris Jansing is joined by Vice Chair of the House Oversight and Reform Committee, Congresswoman Katie Hill to discuss. Michael_Novakhov shared this story from Trump Investigations, Middle East, and Israel from Michael_Novakhov (5 sites). The special counsel investigation found that President Trump did not coordinate with Russia in the 2016 election.